The Future, without Mrs. H.
Just a couple days ago, in a very mind-numbing work meeting about technology and vendors and storage platforms and On-Demand Cloud Computing, I happened to gaze into my smartphone and let my mind wander as I tend to do, many times a during such meetings. Only this time, I made a very emotional, very bittersweet discovery: that I was officially living in and being a part of “The FutureTM” and, sadly, the mentor who opened my eyes, taught, cajoled, whipped me into shape and ultimately brought me here, was not around to watch it unfold. That mentor was my second grade teacher. ?To protect the innocent, we’ll call her Mrs. H.
For better or for worse, Mrs. H is pretty much the person responsible for exposing me to the world of computers. ?Now, at the risk of dating myself, let me explain: we didn’t have nearly-ubiquitous computing back then, where people could totally the surf the web and Tweet and facebook on their touch screen smartphones, constantly connected, any time of the day or night. ?Hell, we didn’t even even have touch screens back then, or even a web to speak of for there to even exist a Twitter or Facebook. ?Not only were smartphones nonexistent, but cell phones themselves were exceedingly rare, and totally unavailable in the town I lived in at the time. ?Not only were color graphics on your computer a luxury, but just having a computer was a huge deal. No, back then, a teacher still showed us abstract concepts on a blackboard, using chalk. Students turned in assignments written on paper, using Number 2 Pencils. It was an age when the Macintosh was in existence, but way beyond the financial capacity of anyone but businesses and the very wealthy. ?Even so, my elementary school was fortunate. ?Although computers in classrooms were very cutting edge and experimental, and computing budgets in schools simply didn’t exist at the time, they managed to pool together enough cash and purchase what we knew as “The Apple:” a single Apple IIe, bolted onto an A/V cart, and wheeled around the school, shared among dozens of classrooms and hundreds of students from kindergarten through 5th grade. And in this environment thrived Mrs. H.
Mrs. H was an awesome teacher. ?She had been in the classroom teaching second grade little snots like me for at least 25 years. ?In many respects she was a stereotypical schoolmarm, complete with glasses that had a little string around them so she could hang them around around her neck when they weren’t being worn, and never lose track of them. ?Most of the time she was the nicest, sweetest teacher of the whole school. ?But if you goofed off, horseplayed, ran with scissors, gossiped or didn’t do your work, she could instantly turn into the strictest, sternest, meanest disciplinarian in the whole district, and she would set you straight. For Mrs. H, I would always straighten up in the end. ?But not so much because of her spine chilling reprimands, as because she was the school’s Official Keeper Of The Apple. 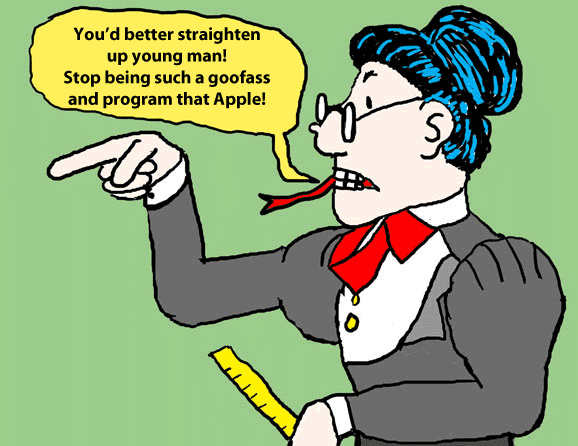 Despite fitting the schoolmarm stereotype, she was the most “with it” in terms of technology in the whole school. ?She knew the most about it, taught the most with it, and consequently, ended up logging the most reserved hours with The Apple in our school. ?And only the students in her class who behaved and did their work would get to use it. ?Although I had never touched one before entering her class, I was enamored with that computer the first time I saw it, and Mrs. H knew it. ?And so it became her most effective bargaining chip in taming the most stubborn goofass of second grade. And so, in her class, I learned like I had never learned before. ?I eagerly did my work as quickly and thoroughly as I could just to get some “computer time.” ?As boring as it sounds now, BASIC programming, even on a green monochrome screen and the most rudimentary of ?audio was pretty damned fun in second grade, when school was the only time you could get exposed to anything related to a computer. ?Mrs. H recognized that, for all my goofassery, I would probably grow up to be one of those guys that does Important Computer Machine Work. “You’re going to be an important part of The Future,” she once told me. ?And she made my dad realize it as well. Sadly, my graduating into 3rd grade meant by default, I would be getting a new teacher who could not even approach the technological awesomeness of Mrs. H, and this meant way, way less “computer time.” ?Fortunately, my dad intervened and struck a deal with Mrs. H to provide me with “advanced” computer lessons after school. ?My mentoring continued for another year. She and I ended up spending an awful lot of time together, and I learned more from her than any other teacher in elementary school. ?In a way, she almost became more like a grandmother or great aunt to me, and she probably spent more time tutoring me than she did any other kid in that school. ?So, I imagine it must’ve been hard for her to sponsor me – without me really knowing at the time – for one of those “gifted kids” programs, where myself and a bunch of other brainy kids would be bussed to some farther away “advanced” elementary school. ?At this school, more money was spent and the ratio of computers to kids was 1 to 5 instead of 1 to 500. ?I continued to learn more and get more constant exposure to technology, but it wasn’t quite the same… because it wasn’t with Mrs. H.
My dad realized this, and struck one final deal with her: that summer, he would pay Mrs. H to tutor me once more. ?This time, it was at her house: a virtual computing paradise, with computers in practically every room. ?Once again, I thrived. ?Even though I was totally turning into a geek before I even reached middle school, it was the best summer I had ever spent. Unfortunately, times ultimately got tough, and due to some unfortunate events money was starting to get tight for my family around this time. ?My dad, knowing he couldn’t pay Mrs. H for computer lessons forever and understandably feeling awkward about her teaching me for free, saved up some cash and gave me The Best Birthday Gift Ever: a computer desk he made himself, and the first computer I could call my own. ?Anything similar to Mrs. H’s Technology Paradise was way out of his monetary reach, but he managed to buy me something just as awesome, if incompatible: the low-priced but advanced and then-ubiquitous Commodore 64. I hadn’t even hit puberty yet, but here I was, the only person on my block with a computer in his own bedroom. ?I was so engrossed in using it, programming on it and playing games with it, that I almost didn’t notice that my visits to Mrs. H’s house rapidly declined in frequency, and ultimately ended forever. The end of the 80s not only signified my last sessions with Mrs H, but ultimately heralded the long-overdue end of the 6502 processor’s dominance in the computer market. 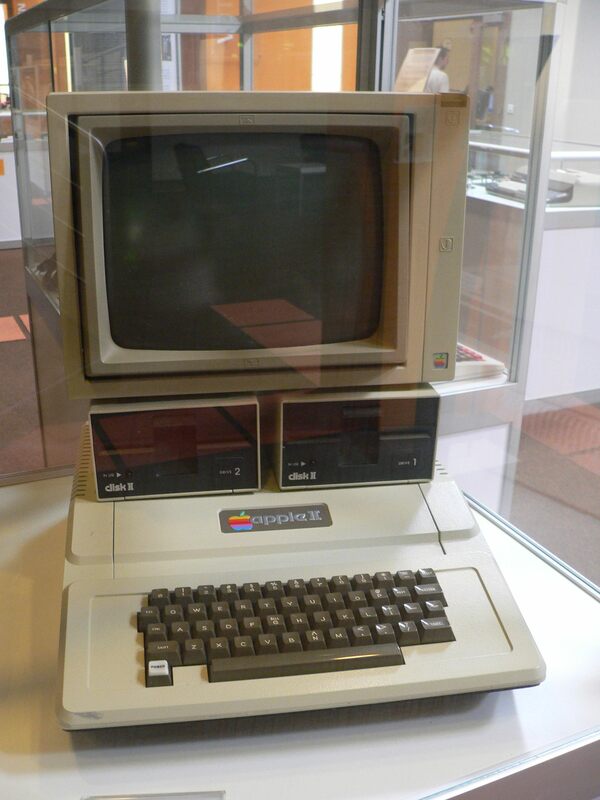 ?The Apple IIs and Commodore 64s of the day rapidly became obsolete, and technology’s breakneck run to new advances, faster processors, and better computers pushed me along for the ride. ?I was in high school by the time this thing called The Internet started making itself known to the public. ?And in college, it became My Life, well before it turned into MySpace for everyone else. ?I rarely consciously thought of Mrs. H, but she was in the back of mind, somewhere. ?Any time I slacked off and realized that my slackage was doing me in, a subconscious schoolmarm rebuke and through-the-bifocals stare would snap me back into reality. ?And every time I did something positive on the web, I sometimes liked to think my mentor would see it and it would make her proud. Today, thanks in no small part to Mrs. H, I am indeed one of those guys that does Important Computer Machine Work. ?The technological decisions I help make when I’m at work affect the lives of countless people, many of whom I’ll never know or meet. ?Many of them are using technology as their primary way to learn, just as I once did. A person who I hadn’t thought about in years had, if only in spirit, once again tried to sternly jolt me out of my listless dawdling. ?Unfortunately for her – and for me – it didn’t quite have the desired effect. ?Rather than focus at the task at hand, I turned to Google, and typed in her name. ?I just?had to know. To my dismay and sadness, but not really my shock, I didn’t find what I hoped I would. ?No Facebook page for Mrs. H flashed across my screen. ?I kept swiping frantically, scrolling search results up and down, hoping to find something. ?No pictures. ?No E-mail contact. ?No current address or phone number. ?Not even a mention of her having taught at my old elementary school. The web, advanced as it is, capable of doing things that not I nor Mrs H. had even dreamed of back in the day, can be very blunt, very macabre, and sometimes incredibly cruel. ?What it did show me was her full name, an entry showing the exact place where she used to live and where I had my summer lessons, and… an opportunity for me to order a copy of her death certificate. Mrs. H had passed away, over a decade ago. Gee… thanks, Google. At that point, I put my iPhone down on the table, sneaked past other attendees clicking away and typing notes into their netbooks, scurried past the bright LED display being used by the presenter to illustrate his abstract concepts, and walked out of the meeting. ?I shut the door to my office, and in front of what is now One of Many Apples that I can use whenever I want, I buried my face in my hands on the desk, not really caring if anyone would give me a stern, sharp rebuke for doing that, and had a good, long cry. I am not nostalgic for the things we had in the past. ?I would not trade my iPhone for a pencil and paper. ?I wouldn’t give back the computers I use now to get a Commodore 64 or an Apple II. ?I wouldn’t dare say that the chalkboard is better than our netbooks and flat panel presentation displays of today. ?But what I am nostalgic for is the person responsible for opening my eyes to potential greatness of all the things we have now, and what we can do with them. ?I would give away every last bit of technology I own for one more “advanced” computing lesson. It’s The Future, Mrs. H. ?And right now I wish, so badly, that you were here to see how awesome it all is.